On this week’s Social Media Marketing Talk Show with Erik Fisher and Kim Reynolds, we explore Twitter expanding their character count to 280 with Madalyn Sklar, Snapchat’s upcoming redesign and algorithm with Carlos Gil, Facebook Messenger updates and other breaking social media marketing news of the week! If you’re new to the show, click on the green “Watch replay” button below and sign in or register to watch our latest episode from Friday, November 10, 2017. You can also listen to the show as an audio podcast, found on iTunes/Apple Podcast, Android, Google Play, Stitcher, and RSS. 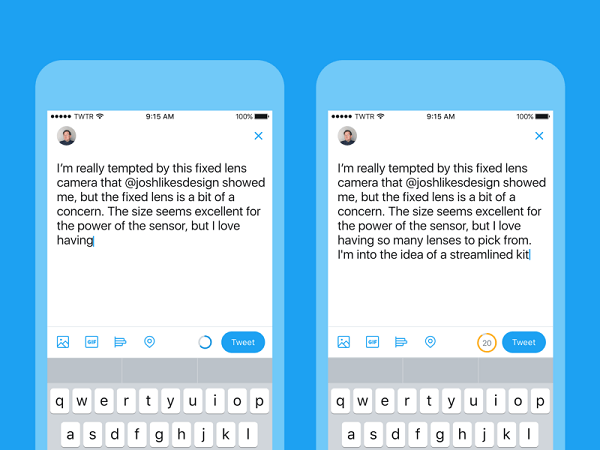 Twitter replaced the old character counter with new circle icon that changes colors as you type. 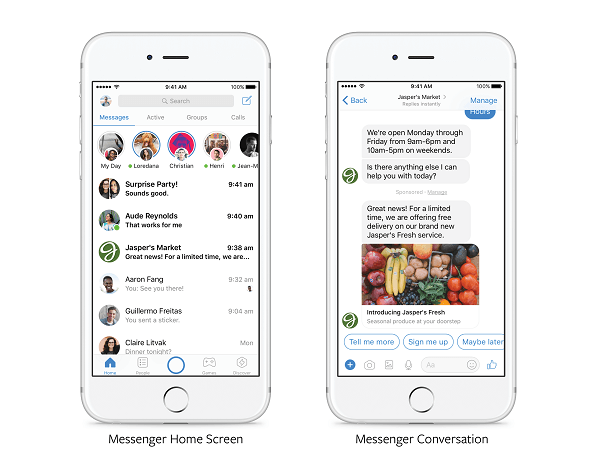 Facebook announced that “in the coming months,” all advertisers will be able to send relevant promotions directly to customers who have previously communicated with the brand in Messenger. 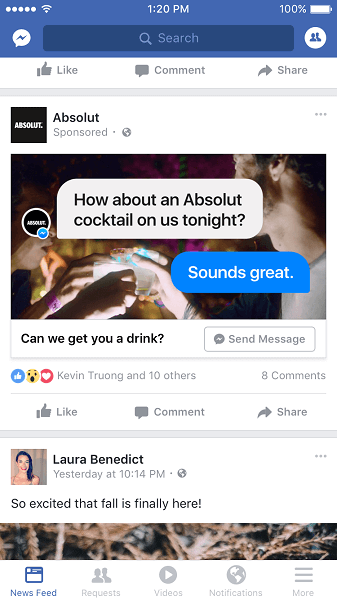 Facebook rolls out news feed ads that open a Messenger conversation. Facebook Developing Possible Breaking News Tag for Publisher Posts: Facebook confirmed plans to test a new Breaking News tag that publishers will be able to attach to their posts but it didn’t share any further details. It’s speculated that “adding a tag like that to a post could temporarily push stories higher into users’ feeds, generate some sort of alert or notification, or at least help them stand out visually.” This feature was first spotted by Matt Navarra. Facebook Possibly Testing New Red Envelope Feature for Sending Money to Family and Friends: Facebook appears to be taking steps to appeal to users in and connected to China with a new “red envelope” feature for gifting cash to friends and family. This is a popular practice during holidays like Chinese New Year. When asked to confirm this possible new feature, Facebook simply stated that it’s “always testing new product experiences but there’s nothing specific to talk about at this time.” While Facebook already offers peer-to-peer payments through the Messenger platform, this update will be the first of its kind on the flagship Facebook site and could usher in supported payments for Marketplace and other sections of Facebook within the site. This feature was first spotted by Matt Navarra. Facebook Adds New Monetization Tab for Instant Articles: Facebook now allows Instant Article publishers currently using the Audience Network to push recirculation ads to “easily turn these ads on or off” in the new Monetization tab. 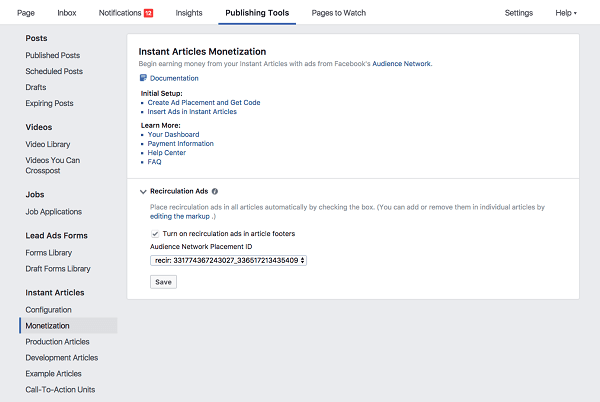 The Monetization tab can be found in the Instant Articles section of Publishing Tools within the Facebook Audience Network. Facebook now allows Instant Article publishers currently using the Audience Network to push recirculation ads to easily turn these ads on or off in the new Monetization tab. Instagram Allows Users to Upload Older Photos and Videos to Stories: Instagram now allows any photos and videos taken beyond 24 hours ago to be uploaded to Instagram Stories. 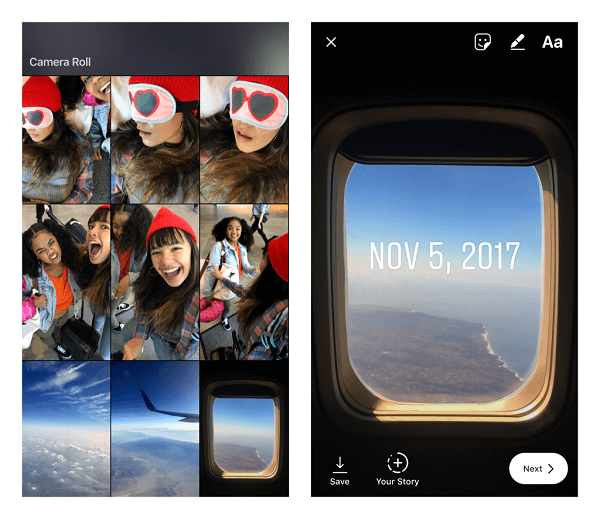 Instagram previously limited the Stories feature to “glimpses” into a user’s day, but this update offers more flexibility and creative choices. Instagram now allows images and videos taken more than 24 hours ago to be uploaded to Stories. Instagram Pushes New Format for Sponsored Posts to More Influencers: Instagram expanded its branded content tool to more celebrities and influencers. The tool helps users better identify sponsored posts, creates a standardized format that clearly indicates that a post is a “paid partnership” from an advertiser or sponsor, and provides data about a post’s performance. It will also notify accounts when it detects that they’ve shared branded content without using this tool and give them the option to “tag a business” in their post. Instagram Test Ability to View Bookmarked Posts on the Web: Instagram introduced saved posts on its platform almost a year ago and now select users can view those “Pinterest-like” bookmarked posts in their web browsers. Instagram confirmed that it’s currently only testing this new feature and it hasn’t officially rolled out to everyone. Users can check their Instagram profile on the web for a new Saved tab to find out if they have it. Facebook gives businesses an easier way to manage their ad budgets and achieve optimal results with the new campaign budget optimization tool. Facebook Adds Housing Rentals to Marketplace: Facebook announced it’s partnering with sources like Apartment List and Zumper and working directly with brokers, agents, and other property managers to pull in “hundreds of thousands” of housing rentals into Marketplace. Searchers will be able to filter housing listings by a number of options such as location, price, rental type, number of bedrooms, and much more, and view 360-degree photos of properties when available. 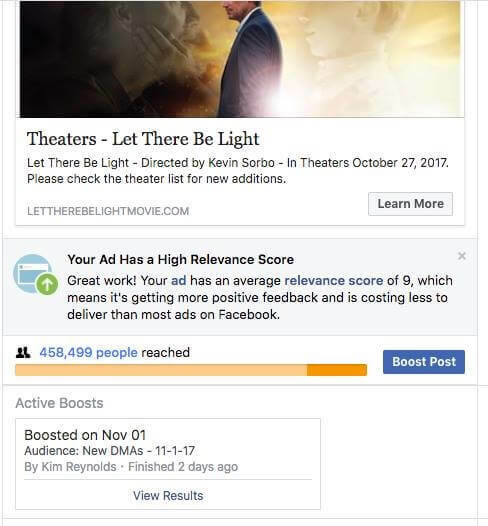 Facebook appears to have rolled out new data and metrics for boosted posts. LinkedIn Introduces Resume-Building Tool Integrated With Microsoft Word: Microsoft is “bringing the power of LinkedIn into Microsoft Word” with the launch of a new resume-building feature called Resume Assistant. Users will be able to craft a compelling resume directly within Microsoft Word with insights and job-specific details directly from LinkedIn. Once a user selects their desired role and industry, Resume Assistant will pull LinkedIn insights from millions of member profiles as examples of how other professionals in that role describe their work and present their skills. Resume Assistant also suggests relevant LinkedIn Learning courses that could “strengthen your chances of getting hired” and creates a shortcut to LinkedIn’s Open Candidates feature, which connects job hunters with recruiters. LinkedIn Debuts Sales Navigator Lite for Gmail: LinkedIn released a free version of Sales Navigator for Gmail that gives users insights about their email contacts from their LinkedIn profiles. It also highlights mutual connections and provides greater context about the person you’re trying to reach. The LinkedIn Sales Navigator plugin is currently available from the Google Chrome Web Store.